President Obama’s job approval rating dipped to 44% for the week of Aug. 9-15, the lowest weekly average of his administration by one percentage point. The drop in Obama’s weekly average was driven by particularly low ratings near the end of the week, with record-low three-day rolling averages of 42% for Aug. 12-14 and Aug. 13-15 polling. Prior to this weekend, Obama’s three-day low had been 44%. 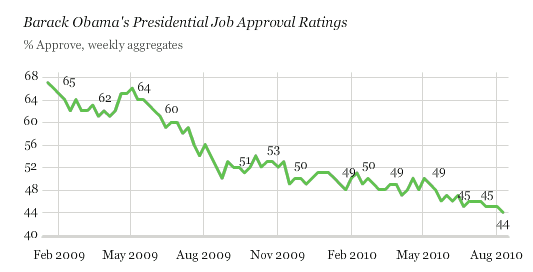 Additionally, Obama’s disapproval rating reached 50% for the first time in the Aug. 13-15 average. The overall pattern of Obama’s job approval ratings within partisan groups is fairly stable. The 68-point difference between Democrats’ and Republicans’ approval ratings for Aug. 9-15 is in line with what has been the case for many weeks, while his 39% approval among independents is down slightly from the past several weeks. On a historical basis, the Democrats under Jimmy Carter suffered the slimmest seat loss of a party whose president was below 50% approval, losing 11 seats in the 1978 midterms. 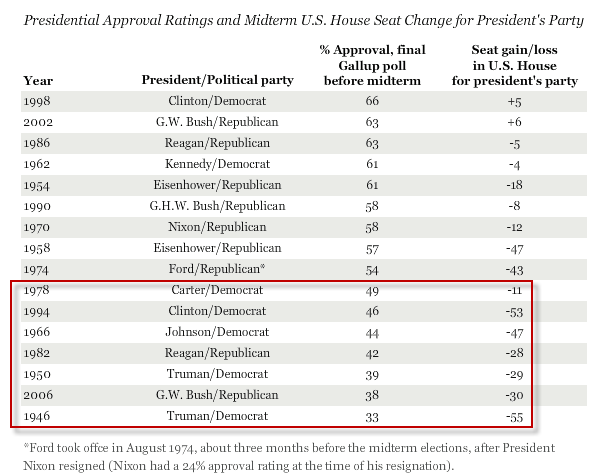 More recently, Bill Clinton in 1994 and George W. Bush in 2006 saw their parties lose enough seats in the House to turn party control over to the opposition party when they had less than majority approval. It is virtually certain Democrats will lose seats in the upcoming election. Averages suggest 36 seats. Republicans need to pickup 40. The approval rating at 12% for Republicans is probably not much different than an approval rating at 35%. They were not voting Democratic anyway. Looking at the second chart provides some clues. Independents overwhelmingly went to Obama in the Presidential election, as did the youth vote. Obama has literally abandoned youths who turned out en masse for him. Health care "reform" was financed by sticking it to young healthy workers and small businesses. 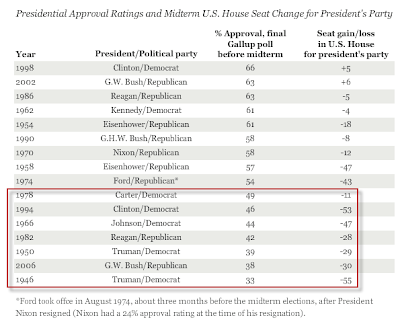 More importantly, a 35 point drop in the approval rating by independents looks ominous. It would be interesting to see the approval rating of Carter by independents when he only lost 11 seats. Another factor is economic data has generally been grim.